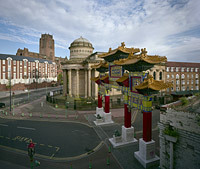 In 2008 John Davies was invited to curate, organise and contribute new work for the 'Cities on the Edge' photography project for the Liverpool Culture Company as part of Liverpool Capital of Culture 2008. The Cities on the Edge programme was a cultural initiative of Liverpool and a collaboration between the partner cities of Bremen, Gdansk, Istanbul, Liverpool, Marseille and Naples. Photographers from 6 European port cities were invited to visit Liverpool in 2008 and explore the relationship - visual, cultural, social, political - between their home city and the host city. The photographer/artists represented are: Gabriele Basilico - Naples, Philippe Conti - Marseille, Wojtek Wilczyk - Gdansk, Sandy Volz - Bremen, Ali Taptik - Istanbul and John Davies - Liverpool. The resulting exhibition was first shown at Novas, Contemporary Urban Centre, in Liverpool from 13 November to 20 December 2008. The entire framed exhibition now forms part of the Open Eye Heritage Archive. For exhibition loan details contact the Director, Open Eye Gallery, Liverpool. 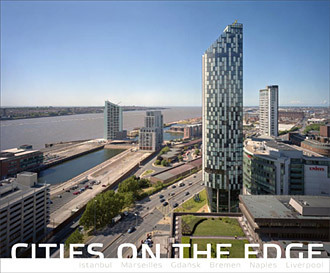 The book 'Cities On The Edge' was published by Liverpool University Press in November 2008. With introduction text by Franco Bianchini, Professor of Cultural Planning & Policy at Leeds Metropolitan University. Edited by John Davies who also provides biographical notes on all the photographers as well as the book cover image. 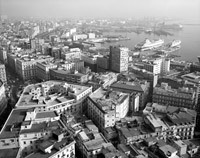 The book has 72 colour and B&W photographs from the six cities and with text translated in the language of each city. Gabriele Basilico is fascinated by the architectural structures of the built environment and the impact they have on the port cities of Naples and Liverpool. He has established an international reputation and has worked extensively throughout Europe and in other parts of the world but has rarely worked in the UK before now. Philippe Conti has made an investigation of housing schemes, neighbourhoods and immigrant communities in both Marseille and Liverpool. In Marseille he photographed the modern housing scheme of Plan d’Aou and in Liverpool he chose to concentrate on the regeneration area of Granby in Toxteth. John Davies chose to photograph two areas in central Liverpool reflecting his interest in the transformation of our social and post-industrial landscape: the Ropewalks area and the recently built landmark developments in the city. Ali Taptik made portraits in the neighbourhoods of Everton, Anfield and Kensington. 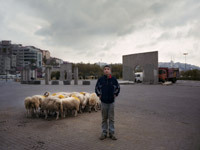 Similar to his Istanbul work, he finds environments where people can connect with the space - where strangers can feel comfortable. He is fascinated by the multiplicity of the city and how people change and exist within the space of the city. Sandy Volz concentrated on traditional public houses in Bremen and Liverpool as spaces that have a social significance. She examines the interplay between the private and the public and in the symbols of national identity found in the interiors of a variety "local" pubs. Wojtek Wilczyk is interested in the post-industrial landscape of both Gdansk and Liverpool. He concentrated on the older places and spaces that are about to change. The Cities on the Edge programme is part-financed by the European Union under the Culture 2007 - 2013 Programme.